IFBB Pro League Competitors compete in a two-piece suit. The bottom of the suit must be v-shaped. Thongs are prohibited. Competitors can compete in an off-the-rack suit. All suits must meet acceptable standards of taste and decency. 2. 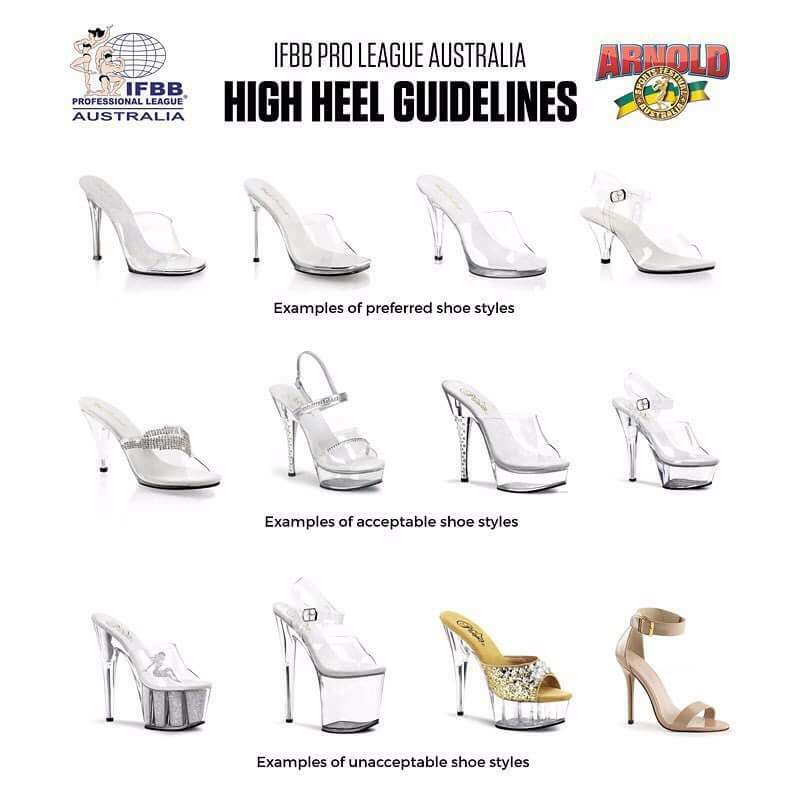 Competitors must wear high heels. 3. Competitors may wear jewelry. We live in a democratic society so you have a choice. Two-piece swimsuits are required. Thongs or G-Strings are not acceptable. Two-piece bikini in a solid colour (no patterns, foils, holograms, lace etc). Studs, stones, rhinestones, beads or appliqués are allowed on the bikini including the straps and connectors. There must be appropriate coverage at the back of the bikini. Thongs or T-back bikinis are not acceptable. High heeled clear top shoes must be worn. The shoes should be a minimum of 4 inches in height. Studs, stones, rhinestones and beads are acceptable on shoes (excluding the top which must be clear). Jewellery such as earrings, necklace, bracelets and anklets are acceptable, but should not obscure the physique. Bikini: Any two piece colour pattern and style that best compliments your physique. Thong style or any other inappropriate swimwear is absolutely not allowed. Attire will be a 2 piece bikini of any colour, fabric or texture that may be decorated with crystals or similar. The bikini bottom must cover all of the frontal area & be tasteful & feminine from the rear. Shoes can be of any style but must not be of an obvious platform sole & should have a maximum of a 3 inch heel. Athletes must not wear tiaras or any other head-dress. Jewellery can be worn but must be tasteful & not detract from the physique. Bikini, jewellery & shoes will not be judged. In the Bikini round competitors require a two-piece fashion bikini. There is no restriction on fabric or style. However, avoid the ‘posing costume’ typical of Ms Physique and Bodybuilders. A Fitness Model will be better served wearing a bikini that displays a sense of fashion and style. Bikini & Fitness Required Attire – A two-piece fashion bikini. There is no restriction on fabric or style. However, avoid the ‘posing costume’ typical of Ms Physique and Bodybuilders. A Bikini Model will be better served wearing a bikini that displays a sense of fashion and style.